One of the oldest text of Chinese medicine is the Huang Di, The Yellow Emperor’s Classic of Internal Medicine, which may be at least 2,000 years old. Chinese medicine has developed acupuncture, acupressure, herbal remedies, diet, exercise, lifestyle changes, and other remedies as part of its healing methods. Nearly all of the forms of Oriental medicine that are used in the West today, including acupuncture, acupressure, shiatsu, and Chinese herbal medicine, have their roots in Chinese medicine. One legend has it that acupuncture and acupressure evolved as early Chinese healers studied the puncture wounds of Chinese warriors, noting that certain points on the body created interesting results when stimulated. The oldest known text specifically on acupuncture points, the Systematic Classic of Acupuncture, dates back to 282 A.D.Acupressure is the non-invasive form of acupuncture, as Chinese physicians determined that stimulating points on the body with massage and pressure could be effective for treating certain problems. Outside of Asian-American communities, Chinese medicine remained virtually unknown in the United States until the 1970s, when Richard Nixon became the first U.S. president to visit China. On Nixon’s trip, journalists were amazed to observe major operations being performed on patients without the use of anesthetics. Instead, wide-awake patients were being operated on, with only acupuncture needles inserted into them to control pain. At that time, a famous columnist for theNew York Times, James Reston, had to undergo surgery and elected to use acupuncture for anesthesia. Later, he wrote some convincing stories on its effectiveness. Despite being neglected by mainstream medicine and the American Medical Association (AMA), acupuncture and Chinese medicine became a central to alternative medicine practitioners in the United States. Today, there are millions of patients who attest to its effectiveness, and nearly 9,000 practitioners in all 50 states. Acupressure massage performed by a therapist can be very effective both as prevention and as a treatment for many health conditions, including headaches, general aches and pains, colds and flu, arthritis, allergies, asthma, nervous tension, menstrual cramps, sinus problems, sprains, tennis elbow, and toothaches, among others. Unlike acupuncture which requires a visit to a professional, acupressure can be performed by a layperson. Acupressure techniques are fairly easy to learn, and have been used to provide quick, cost-free, and effective relief from many symptoms. Acupressure points can also be stimulated to increase energy and feelings of well-being, reduce stress, stimulate the immune system, and alleviatesexual dysfunction. Chinese medicine views the body as a small part of the universe, subject to laws and principles of harmony and balance. Chinese medicine does not make as sharp a destinction as Western medicine does between mind and body. The Chinese system believes that emotions and mental states are every bit as influential on disease as purely physical mechanisms, and considers factors like work, environment, and relationships as fundamental to a patient’s health. Chinese medicine also uses very different symbols and ideas to discuss the body and health. While Western medicine typically describes health as mainly physical processes composed of chemical equations and reactions, the Chinese use ideas like yin and yang, chi, and the organ system to describe health and the body. Everything in the universe has properties of yin and yang. Yin is associated with cold, female, passive, downward, inward, dark, wet. Yang can be described as hot, male, active, upward, outward, light, dry, and so on. Nothing is either completely yin or yang. These two principles always interact and affect each other, although the body and its organs can become imbalanced by having either too much or too little of either. Chi (pronounced chee, also spelled qi or ki in Japanese shiatsu) is the fundamental life energy. It is found in food, air,water, and sunlight, and it travels through the body in channels called meridians. There are 12 major meridians in the body that transport chi, corresponding to the 12 main organs categorized by Chinese medicine. Disease is viewed as an imbalance of the organs and chi in the body. Chinese medicine has developed intricate systems of how organs are related to physical and mental symptoms, and it has devised corresponding treatments using the meridian and pressure point networks that are classified and numbered. The goal of acupressure, and acupuncture, is to stimulate and unblock the circulation of chi, by activating very specific points, called pressure points or acupoints. Acupressure seeks to stimulate the points on the chi meridians that pass close to the skin, as these are easiest to unblock and manipulate with finger pressure. Acupressure can be used as part of a Chinese physician’s prescription, as a session of massage therapy, or as a self-treatment for common aches and illnesses. A Chinese medicine practitioner examines a patient very thoroughly, looking at physical, mental and emotional activity, taking the pulse usually at the wrists, examining the tongue and complexion, and observing the patient’s demeanor and attitude, to get a complete diagnosis of which organs and meridian points are out of balance. When the imbalance is located, the physician will recommend specific pressure points for acupuncture or acupressure. If acupressure is recommended, the patient might opt for a series of treatments from a massage therapist. In massage therapy, acupressurists will evaluate a patient’s symptoms and overall health, but a massage therapist’s diagnostic training isn’t as extensive as a Chinese physician’s. In a massage therapy treatment, a person usually lies down on a table or mat, with thin clothing on. The acupressurist will gently feel and palpate the abdomen and other parts of the body to determine energy imbalances. Then, the therapist will work with different meridians throughout the body, depending on which organs are imbalanced in the abdomen. The therapist will use different types of finger movements and pressure on different acupoints, depending on whether the chi needs to be increased or dispersed at different points. The therapist observes and guides the energy flow through the patient’s body throughout the session. Sometimes, special herbs (Artemesia vulgaris or moxa) may be placed on a point to warm it, a process called moxibustion. A session of acupressure is generally a very pleasant experience, and some people experience great benefit immediately. For more chronic conditions, several sessions may be necessary to relieve and improve conditions. Acupressure is easy to learn, and there are many good books that illustrate the position of acupoints and meridians on the body. It is also very versatile, as it can be done anywhere, and it’s a good form of treatment for spouses and partners to give to each other and for parents to perform on children for minor conditions. While giving self-treatment or performing acupressure on another, a mental attitude of calmness and attention is important, as one person’s energy can be used to help another’s. Loose, thin clothing is recommended. There are three general techniques for stimulating a pressure point. Tonifying is meant to strengthen weak chi, and is done by pressing the thumb or finger into an acupoint with a firm, steady pressure, holding it for up to two minutes. Dispersing is meant to move stagnant or blocked chi, and the finger or thumb is moved in a circular motion or slightly in and out of the point for two minutes. Calming the chi in a pressure point utilizes the palm to cover the point and gently stroke the area for about two minutes. There are many pressure points that are easily found and memorized to treat common ailments from headaches to colds. For headaches, toothaches, sinus problems, and pain in the upper body, the “LI4″ point is recommended. It is located in the web between the thumb and index finger, on the back of the hand. Using the thumb and index finger of the other hand, apply a pinching pressure until the point is felt, and hold it for two minutes. Pregnant women should never press this point. To calm the nerves and stimulate digestion, find the “CV12″ point that is four thumb widths above the navel in the center of the abdomen. Calm the point with the palm, using gentle stroking for several minutes. To stimulate the immune system, find the “TH5″ point on the back of the forearm two thumb widths above the wrist. Use a dispersing technique, or circular pressure with the thumb or finger, for two minutes on each arm. For headaches, sinus congestion, and tension, locate the “GB20″ points at the base of the skull in the back of the head, just behind the bones in back of the ears. Disperse these points for two minutes with the fingers or thumbs. Also find the “yintang” point, which is in the middle of the forehead between the eyebrows. Disperse it with gentle pressure for two minutes to clear the mind and to relieve headaches. 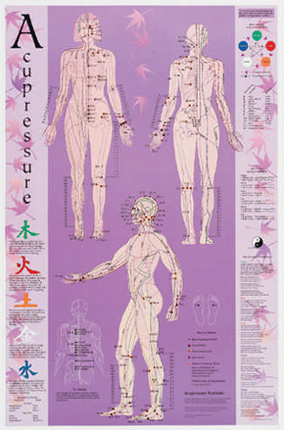 Acupressure is a safe technique, but it is not meant to replace professional health care. A physician should always be consulted when there are doubts about medical conditions. If a condition is chronic, a professional should be consulted; purely symptomatic treatment can exacerbate chronic conditions. Acupressure should not be applied to open wounds, or where there is swelling and inflammation. Areas of scar tissue, blisters, boils, rashes, or varicose veins should be avoided. Finally, certain acupressure points should not be stimulated on people with high or low blood pressure and on pregnant women. In general, Chinese medicine has been slow to gain acceptance in the West, mainly because it rests on ideas very foreign to the scientific model. For instance, Western scientists have trouble with the idea of chi, the invisible energy of the body, and the idea that pressing on certain points can alleviate certain conditions seems sometimes too simple for scientists to believe. Western scientists, in trying to account for the action of acupressure, have theorized that chi is actually part of the neuroendocrine system of the body. Celebrated orthopedic surgeon Robert O. Becker, who was twice nominated for the Nobel Prize, wrote a book on the subject called Cross Currents: The Promise of Electromedicine; The Perils of Electropollution. By using precise electrical measuring devices, Becker and his colleagues showed that the body has a complex web of electromagnetic energy, and that traditional acupressure meridians and points contained amounts of energy that non-acupressure points did not. The mechanisms of acupuncture and acupressure remain difficult to document in terms of the biochemical processes involved; numerous testimonials are the primary evidence backing up the effectiveness of acupressure and acupuncture. However, a body of research is growing that verifies the effectiveness in acupressure and acupuncture techniques in treating many problems and in controlling pain.